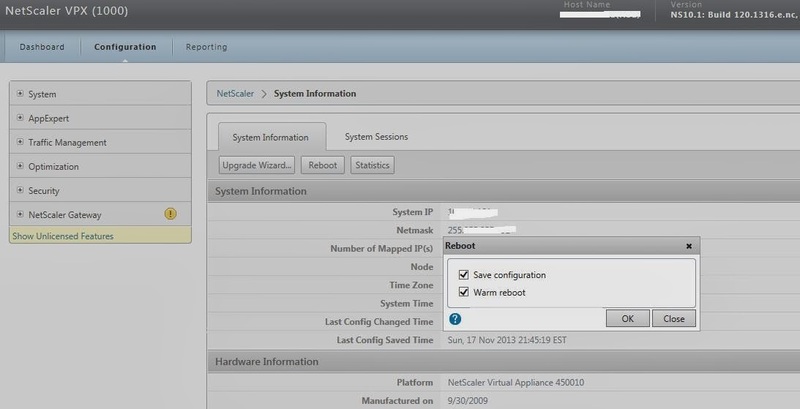 This article explains the steps to restart NetScaler virtual or physical appliance. Again if you are experienced NetScaler administrator, it is an easy task. These instructions are documented for beginners. There are two ways to reboot NetScaler, one is from Console and another from the browser by connecting with NetScaler management IP address. If you are not sure how to get NetScaler IP details, refer this post. - Execute reboot [-warm] command to reboot Netscaler VPX from command prompt. This command reboots/ restarts only NetScaler Service, not Operating system of NetScaler which is not required. If you want hard shutdown of system, use "reboot" this is not recommended. - Then you select optional component “Warm reboot” and click OK.